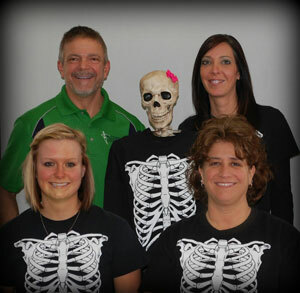 Dr. John M. Bottorff and staff are pleased to welcome you to Advanced Chiropractic. Advanced Chiropractic has been voted The Paper of Montgomery County Reader’s Choice Award winner for Chiropractic Care and Massage Therapy 8 years in a row. We have been providing quality chiropractic care for families in this community since 1981. Our chiropractic and wellness philosophy is unique. We create treatment plans that are focused on optimal health, and ensure you get well faster and stay well longer. Many of our patients begin care only to treat a specific symptom, but then realize the benefit that lifelong wellness care can bring. We believe that health is one of your most valuable possessions. Sadly, some patients start care will us long after their health has deteriorated. So, our initial goal for our patients is relief care. Relief is the initial goal that many of our patients seek. During this initial, intensive stage of care, we make several commitments to you. After we have assisted you throughout this intensive phase of care, we will discuss with you the lifelong benefits of Wellness Care. We encourage and coach our patients to achieve the highest levels of health possible and offer educational opportunities to assist you in your long-term health goals. Our desire is to see our practice members abandon the prevailing sickness care model of health (waiting for symptoms and then taking action), in favor of the emerging wellness model (eating right, thinking right, moving well), to become proactive with their health. Regardless of your health goals, please understand that we see ourselves as mere servants to your wellness needs. Advanced Chiropractic offers a full range of chiropractic wellness care for newborns, teenagers, and adults. Our jobs are about your body, your health and your future. Our responsibility is to offer you the finest chiropractic care possible, with additional services such as Massage Therapy, Cervical/Lumbar Spinal Decompression, Neuromuscular Reeducation, Erchonia Low-Level Laser Therapy, Foot Levelers Spinal Stabilizer Orthotics and Ionic Foot Detoxification. The amount you gain from your care is really up to you and your commitment to your own health. Want to know more? Tour our website. You’ll find answers to many of the most commonly asked questions about chiropractic and natural health care. Interested? Then contact our Crawfordsville office to make an appointment so we may help you make the first step toward a healthier life. During your visit, be sure to mention you viewed our webpage. You will then be entitled to a FREE ION FOOT DETOX.